The” idea” itself has always been the premise for my art making and there has never been a lack of fodder to lay down these ideas. Since childhood, I have wanted to express myself with the pen or the pencil, and convey my thoughts in this manner. I enjoy the process and the challenge with interpreting my ideas or responses to something I have read, heard, seen or experienced. Three interruptions in my work from facing cancer, turned into a theme, artwork, and an exhibit once I returned to the studio. These different challenges have led me to become a multi disciplinary artist and work in various mediums in order to find the suitable expression for my ideas. One of these mediums led me into bronze and sculpture from my painting and the long process of lost wax did not deter me from enjoying the journey toward the final pour. As a child, I assisted my father in his photography lab, watching the magic of imagery unfolding in the trays, and with his encouragement, I have taken that medium along on my journey. Poetry and writing joined my journey, although not as often, when I discovered literature in school was my forte, rather than mathematics. When the wet lab became difficult to manage with the lack of materials, I turned to digital photography and have found graphic art as another outlet. An experiment in schooling in Ottawa, which evolved into The Ottawa School of Art eventually gave me two high school years of art training taught by artists and qualifying me with a first year credit to The Ontario College of Art, which unfortunately I could not follow up on. But with the training I excelled at the figurative and found my preferred subject matter. From photography, poetry, to the figurative, and now embracing the computer, there is no lack of outlet for the constant ideas I employ in my art making. The greatest challenge was learning the lost wax process from a mentor, and with my spouse’s help, we have a back yard foundry to finish those pieces. Wanting to go larger was not feasible, expense wise, so I am working with a project in winter stone, a form of plaster and cement. With a new theme, I am developing a painting exhibit and a sculptural exhibit for the near future. I enjoy staging my art and sharing the finished project with the world. To me, the process is not completed, until, it is unveiled to many viewers and I am able to share my ideas and journey. Having to move more than a few times, I have learned to adjust to new surroundings, always finding new inspiration for my work. Joining groups and co-operatives and working on arts councils gave me resources with which build my art career. These influences are also a part of my art evolution of over 45 years. The artist works and lives in the Maritimes calling Nova Scotia her home. 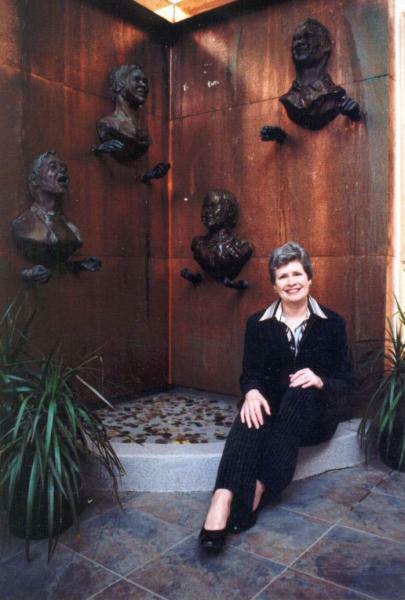 She shares her art practice with her husband who fires her bronze sculpture in a backyard furnace. The landscape and sea is a fountain of inspiration for the artist and influences the backdrops of her statement artwork. The artist speaks to social, philosophical and political events with her paintings and sculptures. Carolyn has been practising her art for fifty years and exhibits regularly.